Memory is a faculty of the soul. The human memory has a great dignity about it, as part of our intellect – but it is driven, in a sense by the will, by the human heart. St Paul reminded his Christian friends in Philippi; “Whatever is true, whatever is honorable, whatever is just, whatever is pure, whatever is lovely, whatever is gracious, if there is any excellence, if there is anything worthy of praise, think about these things.” (Phil 4.8) So too, I am sure Paul would agree; remember these things! Similarly, each Pro-Life person is the memory of an enduring Culture of Life, that is born of the human soul first of all, but that is inspired and lifted up by revealed Christian faith as well. The eight point list St Paul gives us in Philippians is a superb guide to understanding – and recalling to mind – the wonderful Culture of Life that each Pro-Life person has witnessed and experienced. Our Respect-for-Life memory is in essence holy, going back long before the Roe vs. Wade decision of forty years ago. Likewise, the Pro-Life memory is sustained not only by human dignity, history and personal experience but, because it is holy in many respects, it is sustained too by Almighty God. 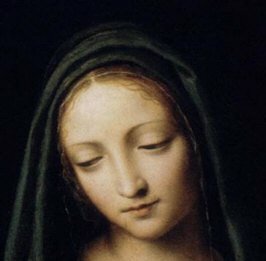 As Mary carried a germinating Credo of Christian faith within her heart – while carrying the Christ within her womb – so too each Pro-Life person carries within his/her heart a Culture of Life memory. Or rather you have been entrusted with this Gospel of Life, to carry it forward as a light; first as a light of memory to strengthen you in your own faith life, and secondly as a light to the nations to guide them back from the shipwrecked shoals of their culture of death, back to the Way that is: True, Honorable, Just, Pure, Lovely, Gracious, Excellent and Worthy of Praise. Because human life is a gift from God and sacred, our Culture of Life memory is stronger than death and holy. IN HER WOMB A DEVELOPING CHILD, IN HER HEART A DEVELOPING CREED – SHE EMBRACES BOTH! AN ANGEL SPEAKS TO JOSEPH – MARY IS THE FIRST PERSON HE TELLS!